Good Saturday evening! We saw mostly dry weather for central Alabama today, besides a few isolated showers that are passing through Marengo and Perry counties right now. Those will end early this evening. Tonight should be nice with pleasant temperatures and a light breeze. Tomorrow will be a great finish to the weekend. Skies will be clear, temperatures will be mild, and there will be a generous wind. On Monday, a weak boundary system will cause extra clouds to develop across much of central Alabama and those south of I-20 could see a few very isolated showers. Dry air settles in behind the system, but some moisture will remain higher in the atmosphere causing a few clouds to remain Tuesday. Wednesday brings with it sunnier weather. With a very dry airmass in place, temperatures will be able to readily warm. Highs will be in the mid 80’s. From there we gradually warm until a more humid airmass starts to move in later in the work week. Next weekend will be dry, but as mentioned a more humid airmass will be moving in. Since this will be happening, it will feel warmer than the first half of the coming work week. As of now though, the weekend looks to remain dry. Looking at the tropics, sea surface temperatures in the Gulf of Mexico are more than primed for tropical development. With such a strong ridge setting in next week, we could see some rising motion develop over the Gulf. Right now in the northern Atlantic, Maria’s remains are continuing to weaken and move northeastward into cooler waters. Closer two the U.S. are two weak tropical complexes. The one over Florida is going to continue to bring numerous unorganized showers there. Most models expect the strong high pressure ridge that will set up in the northeastern U.S will help push the complex into the Gulf. It’s still unsure though how strong the storm will get. We will continue to monitor the storm. The other complex is currently bringing rain for Puerto Rico. Conditions look very unfavorable for any development because of strong upper level winds and frictions interference from landmasses over the various Islands. It is going to be a calm and warm week across Alabama for at least the next seven days. A weak cold front moved through the state and is for the most part bringing in drier air. Temperatures will have dropped from the lower 90s into the 80s, but the biggest story is the dewpoints dropping into the 50s and 60s, giving the air a drier feel to it. It appears that there won’t be any storm systems coming close to Alabama for at least the next 7-10 days as a ridge continues to build over the eastern US. With this, the start to October will feature warm weather and above normal temperatures. Good Thursday afternoon! It’s another mild day across the area, as temperatures reach the upper 80s to low 90s. A light north breeze is developing and this will help to push drier and slightly cooler air into the area on Friday through the weekend. Temperatures tonight will fall into the lower 60s after midnight. Plenty of sunshine is expected Friday, Saturday and Sunday, with no rain chance locally. Highs will warm into the lower 80s during the afternoon hours, with lows in the lower 60s at night. Next week will feature much of the same conditions, as highs reach the lower to middle 80s under a sunny sky. Temperatures at night will warm a tad, with middle 60s likely by that point. In the tropics, Maria and Lee continue to weaken as they both remain in the open Atlantic. There is a new wave developing over Cuba. This feature could become a weak tropical depression or tropical storm over the next 3 to 5 days, but anything significant appears unlikely. We’ll watch it, but there’s no evidence of that system impacting our local weather at this time. Good Wednesday afternoon! It’s another summer like day, with temperatures in the lower 90s across most of central and west Alabama. Skies remain mostly sunny, with no risk of rain through this evening. Expect lows in the upper 60s by sunrise Thursday. A weak cold front will push southward across Alabama on Thursday, with highs in the upper 80s. There is no moisture for rain, so expect a dry frontal passage. A light north breeze will be noticed on Thursday, Friday and Saturday. Highs will dip into the low 80s on Friday, Saturday and Sunday, with low 60s for overnight temperatures. The weekend will include plenty of sunshine. In the tropics, we have Hurricane Maria and Hurricane Lee. Lee is now a major hurricane, but will not impact land. Maria is turning to the northeast with no landfall expected. There could be some weak development near Florida over the weekend, but nothing is set in stone with that feature at this time. Good Tuesday afternoon! Our local weather has turned out hot again this afternoon, but dewpoints are lower. Skies remain mostly clear tonight, with a low in the upper 60s. Wednesday will be the final really hot day for a while, as highs reach into the lower 90s. Expect a good dose of sunshine on Wednesday. A weak surface cold front will push southward across the area on Thursday. With limited moisture, rain is not expected. Highs will top out in the upper 80s on Thursday, with low to middle 60s by sunrise Friday morning. Friday through the weekend will feature lots of sunshine and mild conditions. Highs will top out in the lower 80s, with lows in the lower 60s Friday through Sunday. There is no risk of rain and humidity will be low. 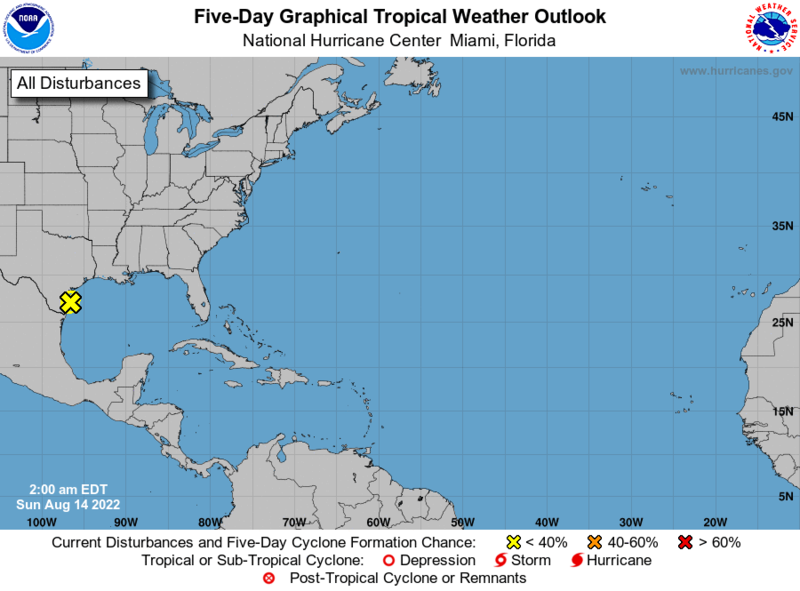 In the tropics, we have Maria and Lee. Maria is weakening to the east of North Carolina. Fortunately, the main impacts are well offshore. Maria is now a tropical storm with winds at 70mph. Lee is getting stronger and could become a major hurricane to the east of Bermuda. Lee will turn northward with time and not impact the US. Good Monday afternoon! Our local weather remains mild this afternoon, as temperatures approach the upper 80s to near 90s in spots. Skies will become mostly clear tonight, with a low in the upper 60s. The small chance of an isolated shower or sprinkle will die out by sunset this evening. Tuesday and Wednesday will feature hot weather again, with highs reaching the lower 90s. Skies will remain mostly sunny both days, so don’t expect much of a break from the heat with cloud cover. Lows at night will dip into the upper 60s both Tuesday night and Wednesday night. A weak surface front will push through the area on Thursday, dropping temperatures back into the upper 80s. Highs will dip into the lower 80s Friday through the weekend, with lows in the upper 50s by Friday night and Saturday night. Expect pleasant weather over the weekend. We have 2 hurricanes in the tropics.. Maria and Lee. Both area a category 1 hurricane, and both storms will not make landfall in the US. Maria will get close enough to the outer banks of North Carolina to bring some rain and breezy winds, but the core of the stronger winds will remain offshore. Very warm and sunny afternoon here in central Alabama today. Highs were in the upper 80s low 90s. There also wasn’t much relief from any heat with a nearly clear sky. Tonight you can expect temperatures to drop into the upper 60s and a few clouds moving in to make for a partly cloudy night and early morning tomorrow. By the time you wake up the air will feel sticky and humid on your way to work. Tomorrow afternoon highs will touch into the upper 80s low 90s again. It will be a very similar day to today. This will be the same for most of your week. Humid, warm, sunny days will last until Friday. On Friday cooler air will move in and highs will be in the low 80s. Sunny skies will continue despite cooler temperatures. Friday night lows will drop back into the upper 50s. Saturday is GAME DAY versus Ole Miss! Good news, it is looking a lot cooler than previous games this year at around 80s degrees during the afternoon. This means with an 8pm kickoff time that temperatures will likely be in the mid to low 70s! This will be a game we may actually be able to enjoy and not be too hot. Until this cooler air comes, make sure to wear sunscreen and hydrate if you plan to be outside.